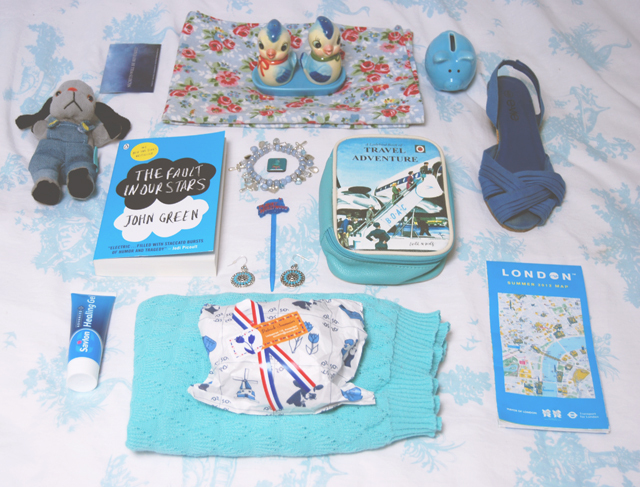 Sweep toy// Card from Warner Bros Studio Tour// Floral tea towel// Birdie salt and pepper shakers// Piggy bank// Shoe from Peacocks// London 2012 map// Vintage jumper// Gift bag from Amsterdam// Savlon gel// The Fault in Our Stars// Charm bracelet// Monster fridge magnet// Ladybird make up bag// Vintage Native American earrings from my grandma// Swizzel stick from Planet Hollywood. I had no idea that I had so many blue things! The fault in our stars is amaazing! It made me cry all over the place! The Fault in Our Stars is awesome! I have too many things haha! It's cute, right? I had to buy one in every colour! Giveaway: Win a large Yankee Candle jar!